Feeding the people of our planet is no small task. It relies on a steady supply of fresh, clean water, and the Food & Beverage industry requires massive amounts of it. Nearly 70% of the world’s fresh water is consumed by agricultural processes, and water shortages are now threatening the ability of Food & Beverage companies to meet the most basic needs of a growing global population. Reuse, recycling, and conservation of fresh water is no longer a luxury. It is critical to ensuring economic and population growth, and in the long term – the survivability of communities, crops, and people. The Food & Beverage industry employs water in a number of processes - primarily process water, cooling water, and boiler feedwater. The overall percentage of water use required of each process varies dramatically among food industries – from 60 percent for processing uses in the meat and poultry industry to 15 percent in sugar processing. Process water uses include the washing of raw materials and process equipment, product conveyance, dissolving/extracting, and addition to the finished product. Cooling water is used to operate refrigeration equipment, to condense steam, or to cool process equipment. Boilers are used to produce steam for cooking, heating evaporators or heating. 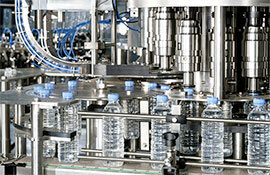 Wastewater from the Food & Beverage Industry often carries a high biological load. This wastewater is typically treated using standard biological processes that include liquid chemicals, which are both toxic and expensive. However, there is chemical-free alternative that can help Food & Beverage companies cleanly reuse, recycle and conserve their fresh water resources: Ozonix® from Ecosphere. Ecosphere’s patented Ozonix® wastewater treatment technology is a cost-effective, chemical-free solution for the treatment and reuse of the large amounts of wastewater generated from Food & Beverage operations. Ozonix® is an industry win-win: both economically viable and environmentally friendly.